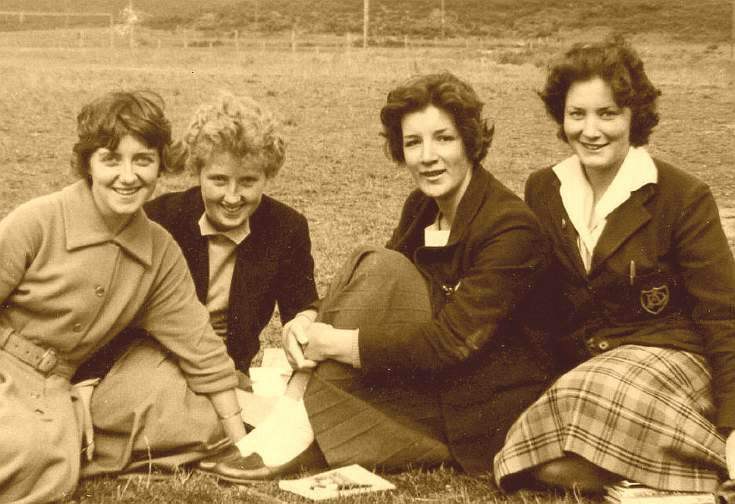 Monochrome photograph of four girls of Dornoch Academy 1959 - This winsome quartet of Dornoch Academy sixth-year girls was snapped by classmate Alex Dingwall near the end of summer term 1959. They are from left: Giorsal Campbell, Tongue; Marigold MacKenzie, Lochinver; Margaret Mackay and Norma Milne, both Bonar Bridge. Margaret, now Ross, and living in Ardgay, is well-known in Royal National Mod circles as former secretary and key member of Mod premier league Dingwall Gaelic Choir. Sadly Giorsal Campbell, who changed her name to the English form Grace, when she went to England, died earlier this year, having lived her last 25 years in Brora as Grace Wakeman. This Dornoch Academy photo, like most of those I earlier passed on to Historylinks, was by Alec Dingwall, using a very basic, but excellent Brownie 127 camera. Sorry to hear about Giorsal Willie, I have fond memories of my school days in Dornoch, and Giorsal was one of those!